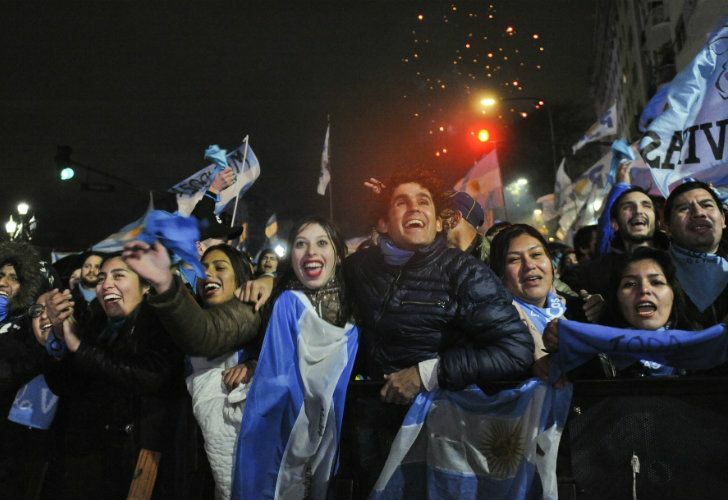 Five months after being presented by President Mauricio Macri in his stateof-the-nation speech, the legalisation of abortion was rejected by the Senate in the small hours of Thursday morning. The 72-seat Senate turned back the bill approved by their lower house colleagues in the Chamber of Deputies in mid-June by a 38-31 vote with two abstentions and one absentee. Outside Congress the numbers were reversed with the massive demonstration by the green camp favouring abortion considerably outnumbering the light-blue pro-life columns. Ruling out a referendum, the government is now falling back on a Plan B of Criminal Code reforms to end the penalisation of abortion without legalising it, a proposal which will be presented in the course of this month. Anticipating this week’s adverse outcome, some senators had tried to amend the lower house bill in this direction but, even if they eventually gained the support of their more adamant colleagues, they could not obtain sufficient committee signatures. So it was the original bill which suffered defeat last Thursday and now cannot return to Congress for what remains of the legislative year. Senate provisional president Federico Pinedo criticised the legislation for sacrificing consensus by mandating state funding and denying exemptions for hospitals on the grounds of conscience. But for many abortion advocates there is no Plan B – abortion on demand will come sooner or later. MONDAY. The week starts with a bang when four businessmen including President Mauricio Macri’s cousin Angelo Calcaterra testify that they made illegal contributions to Kirchnerite election campaigns via former Federal Planning Ministry official Roberto Baratta. On the same day former Techint director Héctor Zabaleta is arrested, thus implicating the multinational engineering giant. TUESDAY. The conviction and immediate imprisonment of Amado Boudou dominates the news but star witnesses within the graft probe include court operator Javier Fernández (who represents Peronism within the AuditorGeneral’s office) and media magnate Rudy Ulloa Igor (who started his career as a chauffeur like Oscar Centeno sparking this crisis). Both basically deny everything but Zabaleta agrees to become a whistleblower. WEDNESDAY. Ex-AFI intelligence chief Oscar Parrilli refuses to testify, dismissing the case as an “absolutely false … invention”. Albanesi grid president Armando Loson (one of the first businessmen arrested last week) confesses to paying bribes to Kirchnerite officials. THURSDAY. Juan Manuel Abal Medina, Cabinet chief from 2011 to 2013, admits that his private secretary Martín Larraburu received money-bags from businessmen delivered by Baratta himself, which were then transferred to the Pink House. But Abal Medina adds that he always thought these contributions were entirely voluntary and not coerced. Meanwhile, Federal Judge Claudio Bonadio summons two big fish of the business community – Techint’s Luis Betnaza and Aldo Roggio, head of the giant construction group bearing his surname. Bonadio also invites the AFIP tax bureau to investigate all companies paying bribes for tax evasion. FRIDAY. Businessman Carlos Wagner secured a deal to turn whistleblower withe courts, while most eyes were on former public works secretary José López (the man who famously threw millions of dollars over the wall of convent) on the first day of the trial over alleged illicit enrichment.Oscar Parrilli, meanwhile, told Bonadio the notebooks were “an invention.” Julio de Vido, in his own appearance before Bonadio, denied in “: categorical and absolute fashion” all the claims levelled against him. In an eventful week replete with arrests, testimony and confessions, perhaps nobody injected more drama into the proceedings than former federal judge Norberto Oyarbide. Weeping, claiming to fear for his life and begging for police protection, he also provided the unusual (perhaps unique) spectacle of a member of the Judiciary offering to be a whistleblower – an offer contradicted by his own lawyer who argued that if his client was completely innocent, he had nothing to tell. Oyarbide eventually told the court very little, apart from naming former spymaster Jaime Stiuso as the main threat to his life. The notorious ex-judge’s protagonism acquires extra significance as the selfsame magistrate who rapidly acquitted the Kirchner presidential couple of any irregularities just before the Christmas of 2009. Amado Boudou, economy minister during Cristina Fernández de Kirchner’s first term and vice-president during her second, was sentenced Tuesday to 70 months imprisonment (starting immediately) for bribery and malfeasance in the fraudulent acquisition of Ciccone money-printing company. The verdict marked the climax of a trial lasting almost 80 months, longer than the sentence. Boudou’s business partner José María Núñez Carmona received the same sentence while four other defendants (including ex-owner Nicolás Ciccone and whistleblower Alejandro Vandenbroele) were sentenced to lesser prison terms. 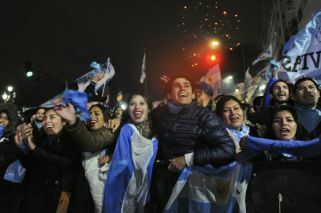 The traditional August 7 feast of San Cayetano (the Neopolitan friar Gaetano Thiene who is considered the patron saint of “bread, peace and work”) shifted its focus from Liniers parish church to Plaza de Mayo when up to 200,000 people converged downtown to press for decent jobs and protest against the International Monetary Fund (IMF). The Tuesday demonstration, organised by CTEP, Barrios de Pie and CCC picket organisations, was unusual from the way it combined often Marxist slogans with images of Pope Francis and saints. All branches of both the CGT and CTA labour umbrella groupings expressed their support. The Jujuy social activist and leader Milagro Sala has begun a hunger strike after being transferred from house arrest in Jujuy to a prison cell in Salta. Both CELS (Centre of Legal and Social Studies) and the local branch of Amnesty International have denounced the Argentine state before the Inter-American Commission on Human Rights as a result. Sala has been denied access to her lawyers, who have presented a habeas corpus writ to the Supreme Court.